We hit with the 2019 CF-XD from DeMarini’s fast pitch line. The bat felt great as it is the fastpitch 2019 CF Zen in a drop 10–which is a top of the class bat. Monster barrel, great performance and, to some at least, a perfect feel on impact. The adjustable length knob felt natural and adjusted on the fly. Here is our 2019 DeMarini CF-XD Review. On the whole, gadgetry in the bat space has not been well received. It has taken Axe bats a number of years to get some legitimacy and many still sneer at its odd shaped handle. The Mako Torq’s spinning handle fizzled. Mizuno’s soft barreled MAXCOR is still on the outs. And remember when RIP-IT filled a bat with Helium? And the Easton Lock & Load (and adjustable swing weight bat) lasted about one season. Our experience with the adjustable length was intuitive. It did have a set of instructions but we never looked at them. The idea of a spin, slight pull, spin back and then a set was a pretty natural approach. 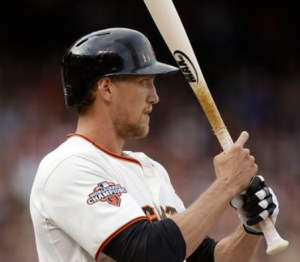 We have no doubt that those with the bat will be able to adjust the length in the batter’s box in a moment’s notice. Despite the ease of use, the idea of a handle whose knob adjusts will be met with derision, no doubt. Why not just choke up? they’ll say. Why not just buy one of those choke rings for a few dollars? Fair enough and reasonable responses. Why not just use choke rings instead? For some, that might be the right answer. The adjustable CF-XD is all of $30 more than the CF Zen in fastpitch. Choke rings aren’t free. Granted, you can pick up two of those for $15. Two is what you’d need to give you the flexibility in sizing the CF-XD gives you. But, if your alternative route is to get some choke rings then buying a CF-XD is $15 more expensive. For at least some, $15 is a imperceptible amount when you are already spending $350. Is $15 worth the the fact that 1) choke rings won’t be lost and 2) you can adjust them on the fly? Possibly. For those who are looking into a CF Zen in fastpitch in a drop 10 with a couple choke rings to extend the useful life of a bat for a growing player, then a CF-XD might make perfect sense. Why not just choke up? We have a hard time combating this (not that we need too, its not like we are trying to sell you the CF-XD. Instead, we are simply trying to help buyers see the justification if they want). But, those willing to buy choke rings might be asked the same question. Why not just choke up? Because, simply enough, it just doesn’t feel the same. The knob’s feel up against the bottom hand gives a different feel than choking up. It is why there is a knob at the end of the bat and it doesn’t slide off at the same diameter. 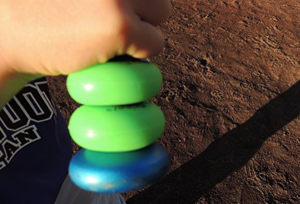 And, for younger players, we can see how familiarity in the feel of the hands, with a knob on the bottom of the hand, could be better than simply ‘choking up’. Is that worth $30 to you? Maybe. As we mention above, those looking for a high end two piece composite fastpitch bat (like the CF Zen or Slugger LXT) should take a look at the CF-XD. Especially, those considering choke up rings or are not quite sure the exact length to buy are prime candidates for this gadgetry. The stated length of the bat is the maximum length of the bat. It will adjust a half inch and a full inch shorter when measuring from the knob to the end cap. Do note, as the point where the bat pivots (or spins around) changes then so does the swing weight of the bat. In other words, as the knob and pivot point moves up towards the end cap then the bat becomes easier to swing. An easier swing is, in fact, why people choke up. The math works out that each 1/2 inch move closer to the end cap the bat swings 5% lighter. As a reference, the 31/22 “Drop 10” CF-XD swings, in terms of balance, much like the 31/21 CF Zen. Aside from the remarkable change in the handle, the bat is exactly like the Drop 10 2019 CF Zen in fastpitch. Expect a long barrel, great balance and top end performance from the 2019 CF-XD. See our full review of the 2018 CFX in fastpitch to get the best sense of where the bat will fit in 2019.